Making your own Christmas tree skirt is a great way to create a holiday heirloom that will become a special part of your celebration for years to come. Tree skirts offer lots of ways for you to express yourself creatively, whether you're an expert seamstress or just learning how to sew. If you're interested in making a complex Christmas tree skirt such as a quilted design, it's best to use a pattern for your project. However, if you're planning a simple tree skirt using basic materials like felt or fleece, you can strike out on your own and let your creativity be your guide. Just follow these steps to make the basic skirt and then have fun decorating it to match your favorite holiday crafts and colors. Fold your felt fabric in half lengthwise, and secure the two layers together with a few pins. Use the tape measure to find the exact center of your fabric on the folded edge, and mark this with the dressmaker's marker. Tie one end of the string to the pencil and pin the other end to the center mark you made on the fold of the fabric. The distance between the dressmaker's marker and the end of the string will be half the diameter of your tree skirt. It's a good idea to make this about 30 inches. Keeping the string taut, draw a half circle on your fabric with the dressmaker's marker. Remove the pin from the end of the string, and shorten the string to about six inches. Repin the end in the center of the fold on your fabric, and draw a second half circle. When you're done you'll have two half circles, one much smaller than the other. Cut along both half circles, keeping the fabric layers together as you go. Cut one side of the fold to create an opening for your tree skirt. Use your sewing machine to sew the hook and loop closure on the open part of your tree skirt. Now your base skirt is done, and it's time to have fun embellishing it. Embroider the edge of the skirt with pine boughs, snowflakes, or another fun Christmas theme. Add applique holiday shapes such as snowmen, Christmas ornaments, angels, or other fun motifs. 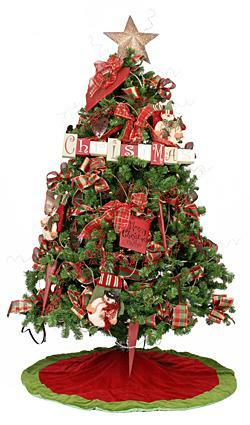 Have family and friends sign the tree skirt with Christmas messages using a fabric pen. Then use embroidery floss to stitch over the writing and create a permanent record of your Christmas memories. Sew glass beads or sequins to the tree skirt for a bit of added holiday sparkle. Have children dip their hands in fabric paint, and make a hand print on the skirt each year. Next to the hand print, write the child's name and age. Sew fringe or pom-poms along the outer edge of the tree skirt to make it extra pretty. Choose a fabric that's easy to work with. While velvet or satin may be pretty, they can be a nightmare if you don't have experience with them. Stick to felt or fleece for an easy alternative and save the fancy cloth for trim. If you're new to sewing, keep the basic design of the tree skirt simple. You can always add style with your embellishments. Pick fabrics and embellishments that match the theme and color of your Christmas decorations. Common pairings are green and gold, red and green, blue and silver, and white and silver. 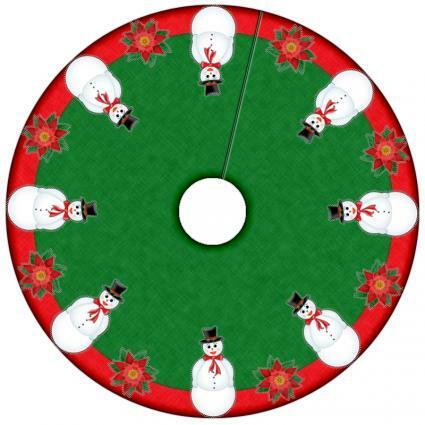 Bucilla Candy Express Christmas Tree Skirt - This adorable candy train-themed tree skirt from Merry Stockings features elaborate felt appliques and embroidery. The stamped felt pieces, backing fabric, beading, embroidery floss, and all other supplies are included, as are detailed instructions. This is an ideal choice if you'd like to make your tree skirt by hand and is suitable for any level of experience. It retails for about $40. Christmas Time Tree Skirt - The kit for this easy-to-make skirt comes with all the materials you need to make it, including the pattern, Hudson Valley fabrics, and backing. The design of diamonds and star points is simple but pretty, and the kit sells for under $27. Regardless of how your decorate your tree skirt or which fabrics you choose to use, you're already making a special family heirloom. This is a Christmas tree skirt you'll use for years to come, and you can always add more details to your basic design later. Have fun making something special to add holiday beauty to your home.